I always like to have a box of Bisquick™ on hand, just in case my hubby wants biscuits. He’s a huge fan of biscuits, I mean huge fan! Since I have yet to master the art of making from scratch biscuits. (I have no idea what I’m doing wrong) I go the Bisquick™ route. Why? because the biscuits always turn out and there are like a gazillon things you can make with Bisquick. Like I’ve started, my hubby is a huge biscuit fan. He loves the biscuits from Hardee’s and so do I! I mean, who doesn’t. I have no idea how they make their biscuits but if and when Hardee’s ever decides to put a boxed biscuit mix on the market, I’ll buy it. Many restaurants have gone that route in the past few years. In fact, Olive Gardens Italian Salad Dressing is a favorite in my house. 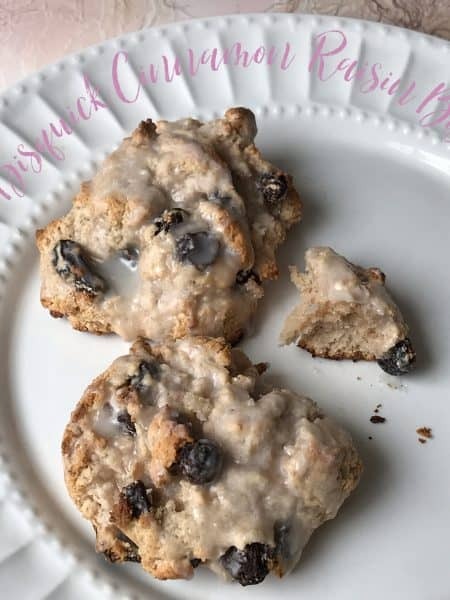 When I saw this recipe floating around Pinterest and read the ingredient list, I thought to myself, “I can make those!” and that’s exactly what I did. 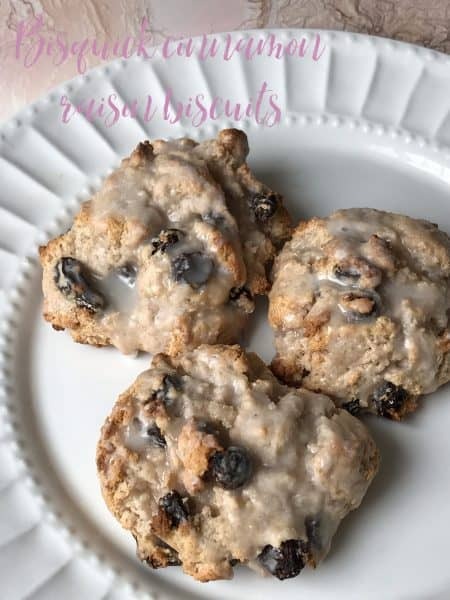 The reviews on Pinterest said that these biscuits tasted like the cinnamon raisin biscuits served at Hardee’s. Well, I’ve eaten a few cinnamon raisin biscuits from Hardee’s in the past and they’re damn good. That sealed the deal for me, cinnamon raisin biscuits it is. Even though Bisquick Cinnamon Raisin Biscuits weren’t as good as Hardee’s, (which I didn’t really expect them to be, I mean not exactly) they were actually very, very comparable. My hubby loved them, which was no surprise and I really liked them too. Which is good for him because if I like something, I’ll make it over and over again! So simple and easy, yet so delicious. 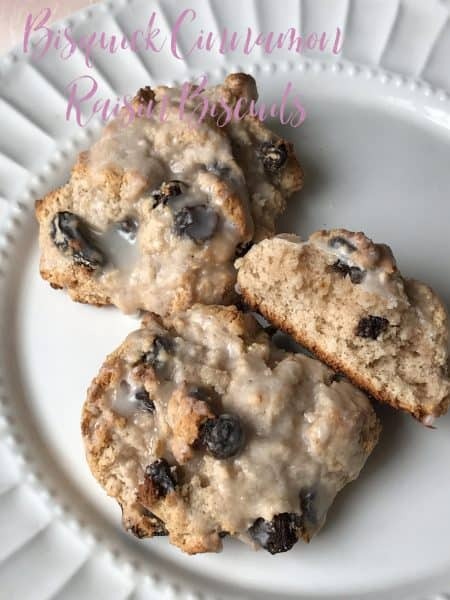 In a medium bowl stir together bisquick, sugar, half and half or milk, raisins and ground cinnamon. Blend just until moistened. Drop by spoonfuls onto ungreased baking sheet. Bake for 12-15 minutes and light golden brown. Meanwhile, stir together powdered sugar, half and half or milk and almond extract until smooth. Remove biscuits from oven a transfer to a wire rack. Drizzle with almond glaze. Serve warm. Broiled Cinnamon Honey Grapefruit and Amish Style Baked Oatmeal are a welcome sight when served for breakfast.